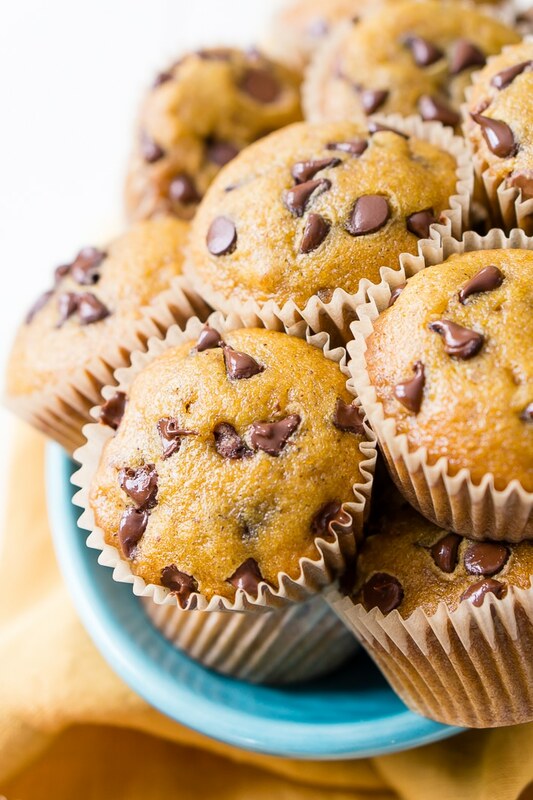 These Pumpkin Muffins are loaded with chocolate chips and spices for a fall breakfast, treat, or snack the whole family will love! Pumpkin bread is a nostalgic staple this time of year, and everyone should have a go-to recipe to pull out when the leaves start to change. While this classic treat will never go out of style, it’s always fun to try different variations of a favorite. That’s why I love Pumpkin Muffins, which are like pumpkin bread in muffin form! Pumpkin Muffins are the perfect grab-and-go breakfast or snack this season. 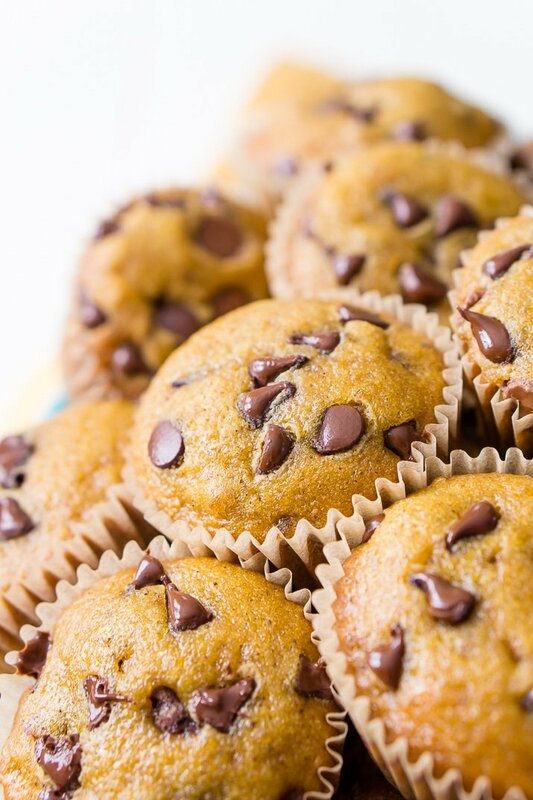 Made with pureed pumpkin, fall spices, and of course, we had to add chocolate chips! These muffins are dense, moist, and filled with everyone’s favorite fall flavors. You’ll enjoy savoring each bite on those cool, crisp mornings while you’re keeping cozy with a hot drink. If you’re a fan of the Starbucks pumpkin bread, you have to try this recipe, which is like a more portable, homemade version. And while the coffee chain only serves it during certain times of the year, you can make these muffins whenever you want. 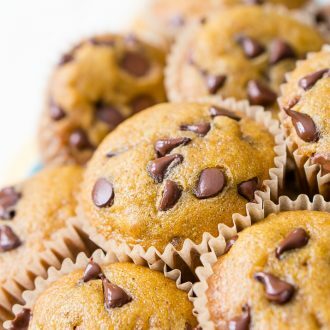 You’ll save yourself a fortune by skipping the drive-thru, plus these pumpkin muffins have an added bonus: chocolate chips! In my opinion, the best way to eat these is by popping these in the microwave until the chocolate is slightly melted and gooey. They make waking up a little easier while you enjoy them with a steaming mug of coffee, tea, or even hot apple cider. Pumpkin Muffins may be just the boost you need before heading to work, or for a little pick-me-up in the afternoon. Kids can’t get enough of these muffins, either! If you have a hard time getting your crew to eat breakfast, these pumpkin muffins are a great option. Whether you have little ones or teens, they’ll love the sweet pumpkin flavor and bits of chocolate chips. They’re easy to pack on those days when everyone is running late and can barely get out the door! They also make a great after-school snack and paired with a glass of milk or hot chocolate, they’ll tide hungry bellies over until dinner. 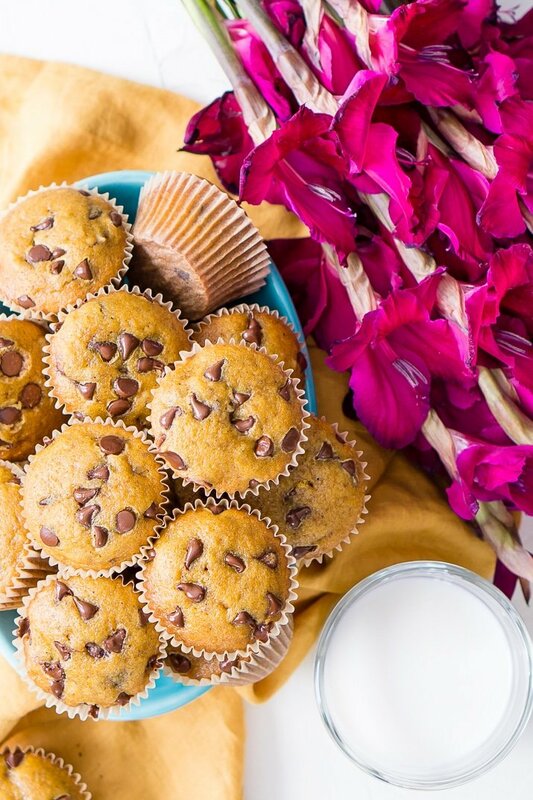 You can’t let the short, beautiful autumn season pass by without getting your fill of seasonal flavor, and Pumpkin Chocolate Chip Muffins fit the bill. A twist on classic favorite flavors, you’ll find any excuse to eat these muffins, morning and night. Muffin Pan – The recipe instructions are based on a standard muffin pan, for any other sizes, you should fill the batter 3/4 of the way full and adjust bake time accordingly. Muffin Liners – I prefer to cook my muffins in liners rather than directly in the pan, these are my favorite ones to use! Pumpkin Puree – You’ll want to use 100% pure pumpkin, not pumpkin pie filling. I prefer the Farmer’s Market Organic Pumpkin brand and it’s much cheaper on Amazon than at the grocery store. Spices – What makes this bread so great is all the spices, I know that those can rack up the grocery bill rather quickly, but have found that they’re much cheaper on Amazon. If you don’t want to buy a ton of different spices, feel free to swap whichever ones you don’t have on hand out for an equal amount of Pumpkin Pie Spice. 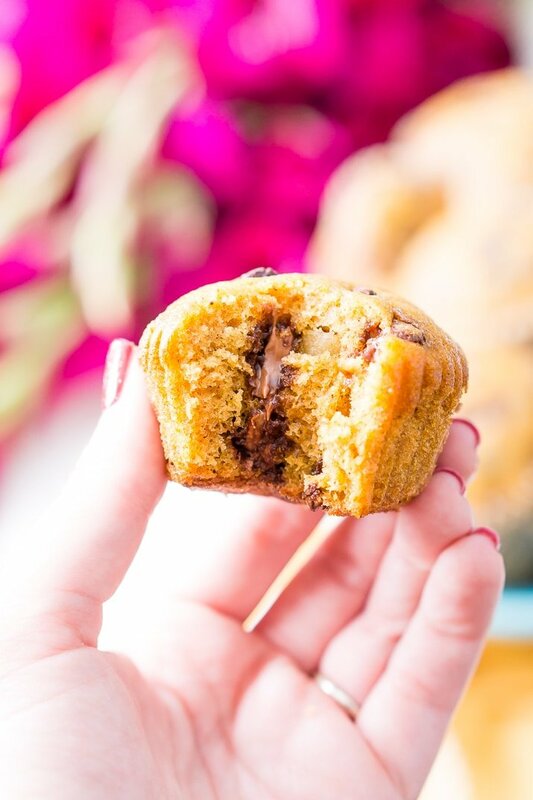 Chocolate Chips – You can definitely make these muffins without them, but why would you when they make them so good! In a large bowl, combine pumpkin, eggs, vegetable oil, vanilla, milk, and sugar. In a separate bowl, whisk together flour, baking soda, salt, and spices. Add about 1/4 cup of batter to each liner in the muffins pan and bake for 17 to 20 minutes or until toothpick comes clean from the center. Repeat twice more to finish the batter. Pin these Pumpkin Muffins for Later! 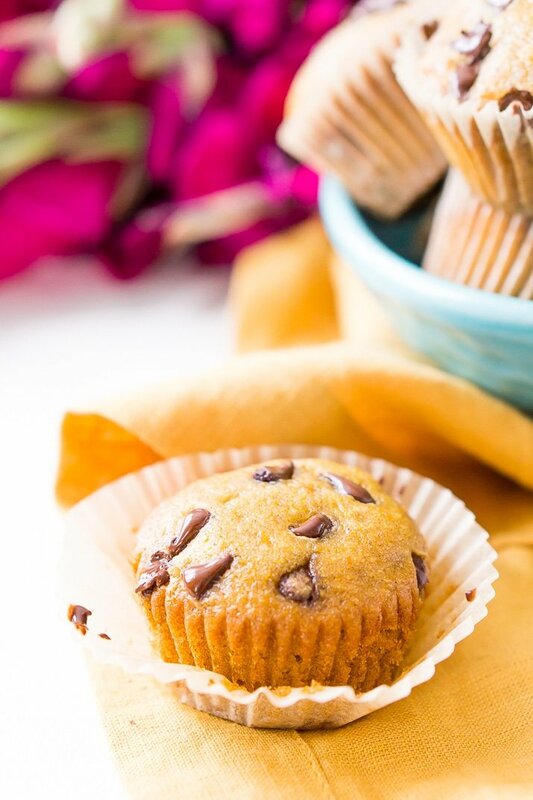 Oh my goodness, pumpkin chocolate chip muffins are my very favorite fall treat and I love how many chocolate chips these are stuffed with! My son LOVES these, mainly because of the chocolate chips. HA! Love a good pumpkin recipe in the fall! No one says you can’t have pumpkin year round! Enjoy! I am looking for your original blueberry muffin recipe with nutmeg. I keep getting the one with the crumb topping. I really liked the other one! Wish I had written it down! Is there a way for me to get my favorite recipe? Thanks! Have never had anything like this, but they look great. Thanks!